Students at Lakeside Lutheran High School recently hosted an event called “New Friends,” where the high school teens and individuals from the community met on the high school campus to join in an afternoon of fun and new friendships. Members of Lakeside’s Teens for Christ service group organized the day to connect teens with young people with special needs and their families in a fun-filled atmosphere and build relationships by focusing on abilities, not disabilities. On Sunday, October 22, 63 LLHS students greeted 13 guests in the Lakeside gym. Planned activities included face painting, cookie decorating and eating, pumpkin-painting, bean bag toss, basketball, manicures, slime-making, and card games. Some unplanned activities—human bowling, the Chicken Dance, and line dancing—also took place. Seth Loersch and new friend Will DeNoyer consulted during pumpkin painting. New friends Samantha Kluever and Ben Olson enjoyed the results of their time spent decorating cookies. Kaitlyn Shadoski, Maddy Weisensel and Jennica Jensen began a friendship as they enjoyed face-painting and glittery slime-making together. A table of Uno players enjoyed each other’s company at the New Friends event held at Lakeside Lutheran in October. The manicure table was a popular activity at the recent New Friends event in the Lakeside Lutheran gymnasium recently. Two more similar events are planned for 2018 on January 21 and March 11. Spontaneous dancing to toe-tapping background music proved to be a popular unplanned activity during the recent “New Friends” event at LLHS. Dozens of teens joined with more than a dozen individuals with special needs for an afternoon of fun and games recently at Lakeside Lutheran High School in the first of three “New Friends” events to be held on campus during the 2017-18 school year. New Friends is a program under the auspices of Jesus Cares Ministries. Basketball with new friends was a popular pastime during the recent afternoon event at Lakeside Lutheran. Lakeside Lutheran teens set themselves up as human bowling pins for an impromptu and entertaining game of bowling at the New Friends event recently held on campus. Student teacher Josiah Nommensen shared a devotion, reminding everyone that while they made wonderful friends, they always have Jesus as their true friend. New Friends events at Lakeside Lutheran are also planned for January 21 and March 11 from 1-3 p.m. Those interested in bringing someone are encouraged to contact LLHS Teens for Christ advisor Ruth Hirschfeld at rhirschf@llhs.org or call 920-648-2321 x2210. New Friends is a program started by Jesus Cares Ministries, a national outreach ministry to people with developmental disabilities, their families, and their communities. To see more photos from the day, visit our smugmug page. The Lakeside Lutheran High School Teens for Christ service group will host its first “New Friends” event on its Lake Mills campus on Sunday, October 22, from 1-3 p.m. in the school’s west gymnasium. The focus of the event is to meet and have fun with people interested in participating in a New Friends program through the teen group at Lakeside Lutheran. The October 22 event will offer people with special needs a place to hang out and develop friendships with teens from the school. Young people with and without special needs will join together to participate in a variety of activities, including games, crafts, snacks and music. Pastor Joel Gaertner, National Director of Jesus Cares Ministries, will speak at the school’s October 9 chapel assembly and share information about the New Friends program. Caretakers of anyone with special needs who may be interested in attending the October 22 should contact Hirschfeld at rhirschf@llhs.org, or 920-648-2321. Ext 2210. ​In the spirit of Thanksgiving, LLHS Teens for Christ is sponsoring a school-wide food drive for a local food pantry. Each class is asked for certain food items, although any donations are encouraged. Check posters around school and in the cafeteria to see what food is requested or see poster below. Collection boxes are located in the cafeteria. Bring food anytime between now and the Wednesday before Thanksgiving break. 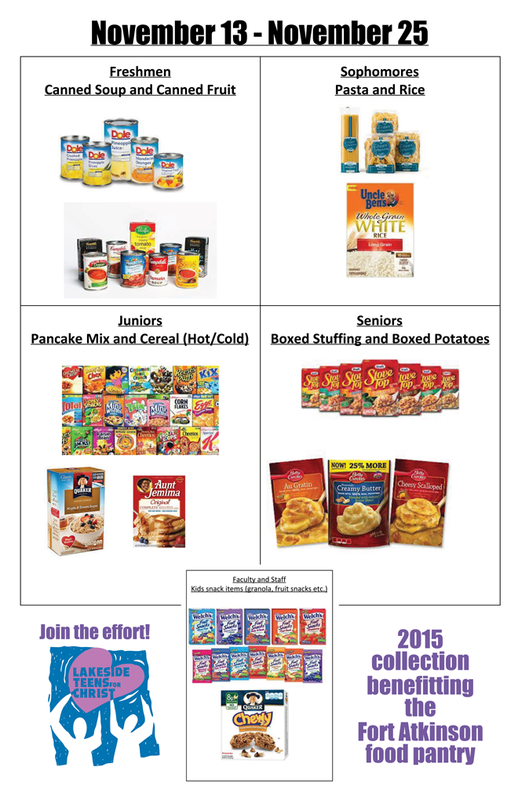 Bring items to boxes LLHS cafeteria by Wednesday, November 25, 2015.